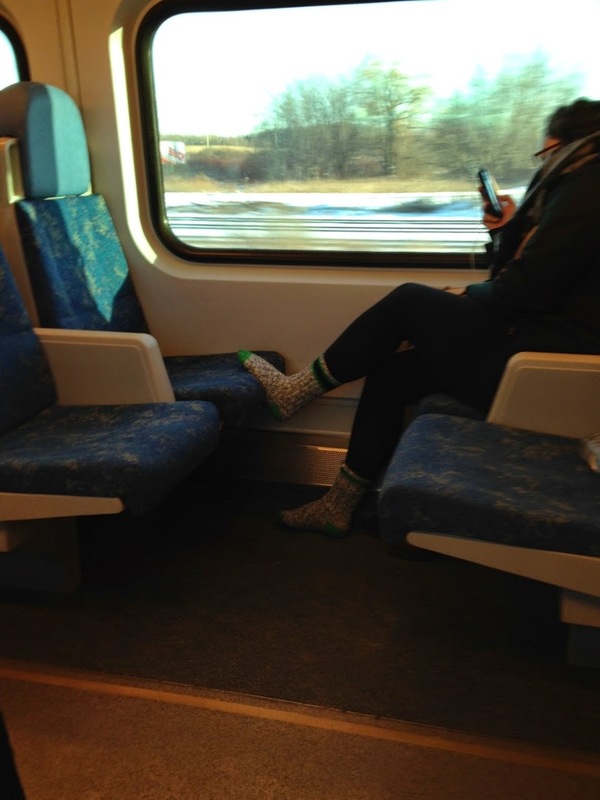 "It truly is a mystery how she boarded the train as her boots or shoes were nowhere to be seen". I like these kinds of puzzles. Judging by the keen intense attention she is professing to her phone, my guess is she went in to Aldo to try on several pairs of boots, all the while following twitter updates from all Kardashian family members. She decided that none of the boots from Aldo were to her, or any Kardashian liking Just then as Kourtney Kardashian was updating what a wonderful taco she just had, this poor woman walked out of the Aldo store leaving the boots she had tried on behind as well as her own, constantly refreshing her twitter feed, and boarded the train in her wool socks. Who needs any real interaction really? I think there's something prophetic about the movie "Her" in that we are evolving, or rather devolving towards becoming full fledged avatars. Maybe someone stole them while she was engrossed with her phone. Actually, it's bad lighting and they are tucked under her seat. Although, it would be fun to play hide the boots when people are so not paying attention to their surroundings. I like your theory Valentino. I am really wishing it were true. But my guess is that the boots/shoes/proper foot coverings are in the shadows under the seat. I liked the game better when we thought she had no boots.